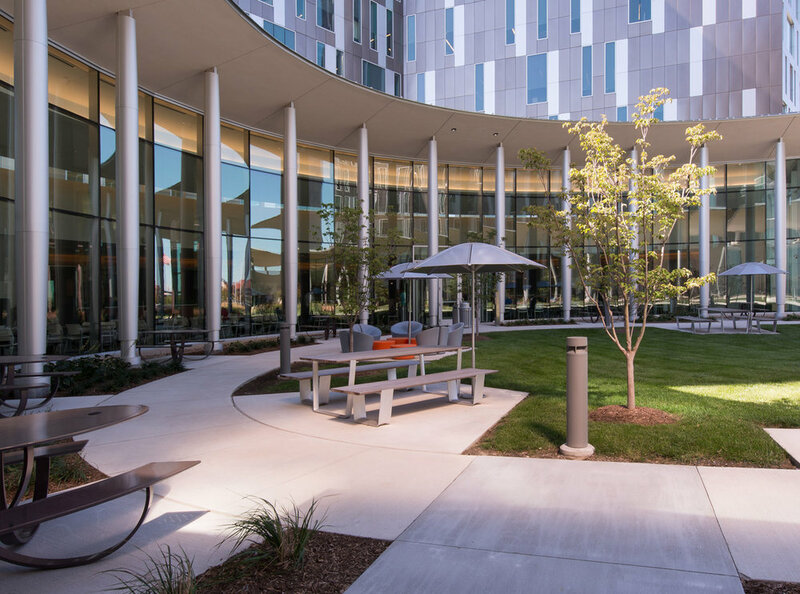 Cerner’s 34-acre Continuous Campus was designed to be the embodiment of innovation and Vireo’s designers were charged with developing a landscape design that built on that spirit. Vireo’s designers worked closely with the architect and civil engineer to develop landscape, hardscape and irrigation design for the campus that includes two large office towers, associated parking, open spaces and a courtyard. A plant palette was developed primarily utilizing plants native to the state of Kansas and the region. The main entry drive and building landscape utilizes a palette of native plants and other drought-tolerant, low-maintenance plantings while the parking lot landscape includes a mix of native trees, shrubs, and grasses supplemented by drought-tolerant perennials. A landscaped courtyard located between the two buildings provides outdoor seating for employees to take breaks, eat lunch, or have small group meetings.